Since I was staying home on Christmas Day with my little dogs, I decided to make a nice meal for myself. 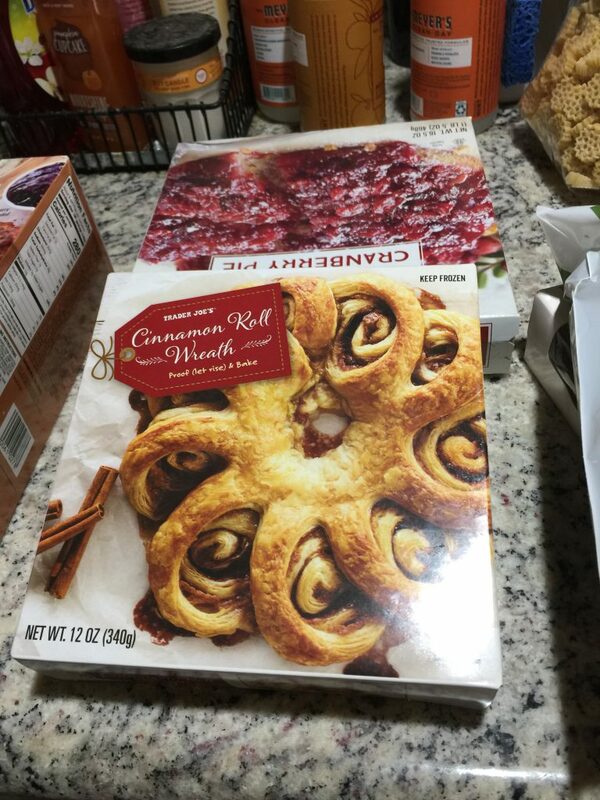 I thought I would start off with Trader Joe’s Cinnamon roll wreath and finish off with the Trader Joe’s Cranberry Pie. 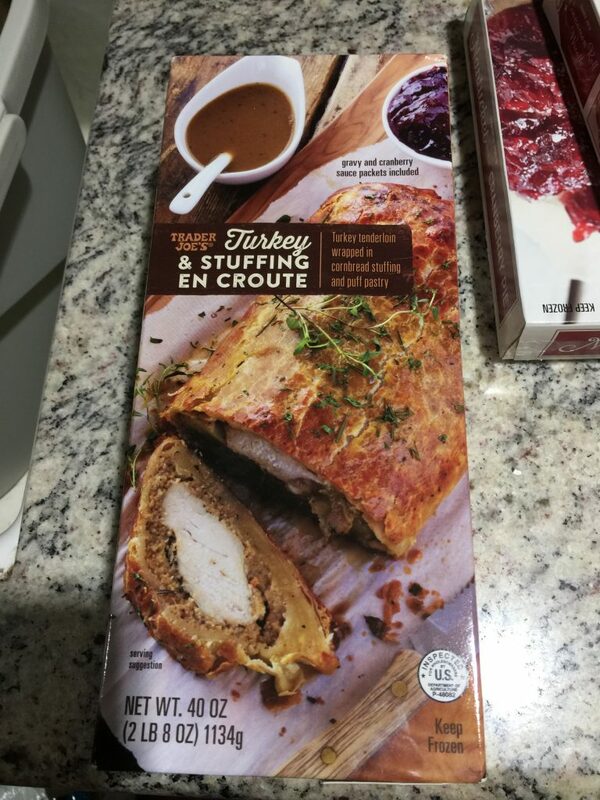 For my main meal, i was planning on having turkey & stuffing en croute from Trader Joe’s. 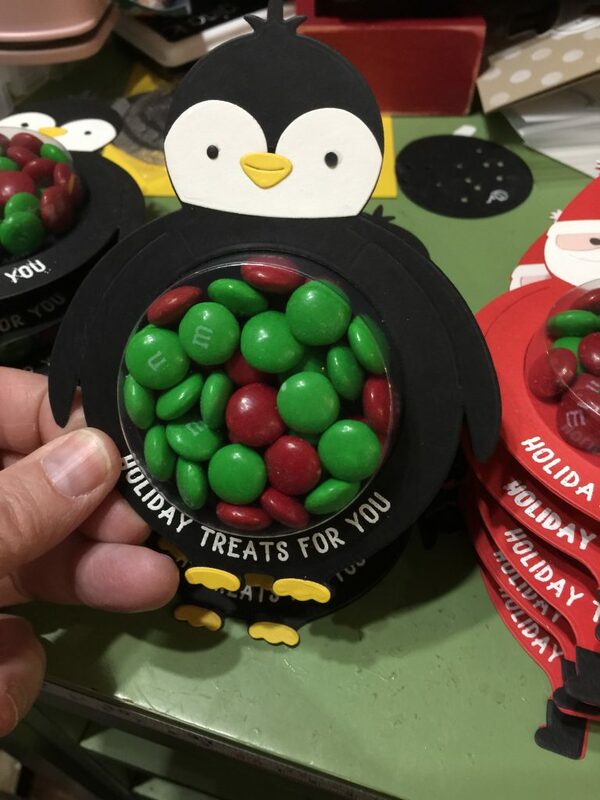 The guy at the store told me a lot of people liked it and it was a popular item during the holidays. So Christmas morning I woke up and after opening gifts I thought I would make the cinnamon rolls. To my horror I discovered that I needed to PROOF the rolls over night. Damn. I resorted to the Pillsbury Pop Up cinnamon rolls in a can. Oh well. Then I looked at the instructions on the turkey! Egads, I did not realize I needed to defrost it in the fridge for 24 hours. TWENTY FOUR hours. What the heck. I decided to just thaw it out on the counter. The house was cold but warmer than the fridge, plus it was sealed in the bag. I figured I would not get sick. 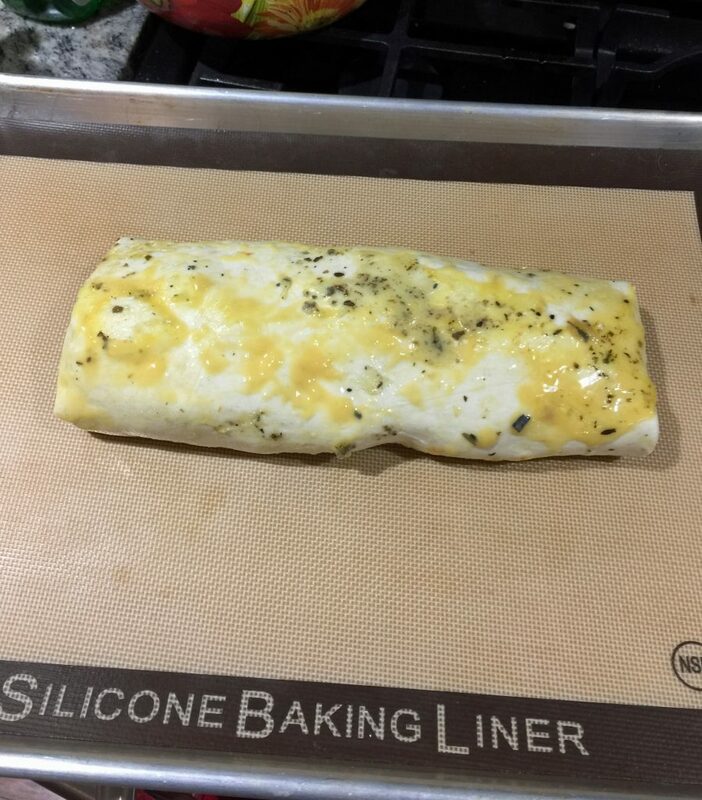 So after several hours of defrosting, I was ready to put into the oven. It was a bit interesting but it felt thawed. Fortunately it came out yummy. 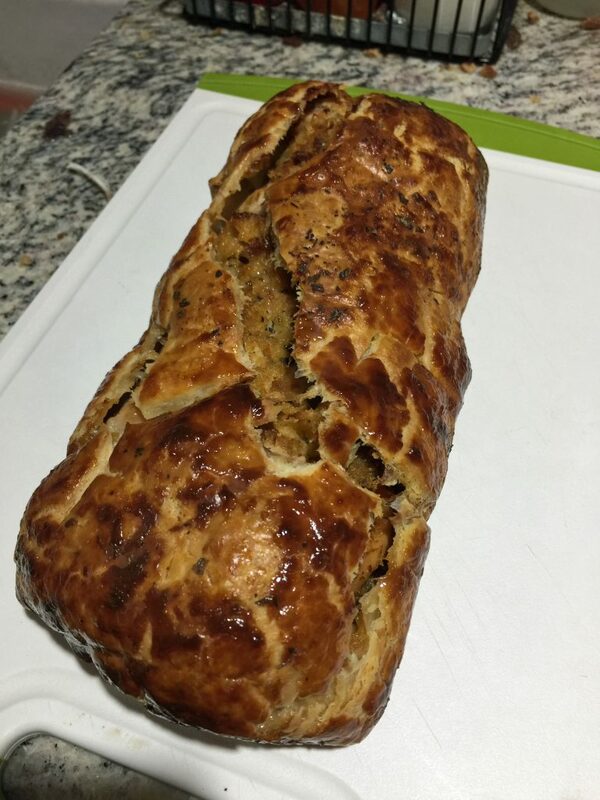 Turkey wrapped in stuffing with a pastry shell around it. It was quite good and actually came with cranberry sauce on the side. A very good dinner considering my failure to read. 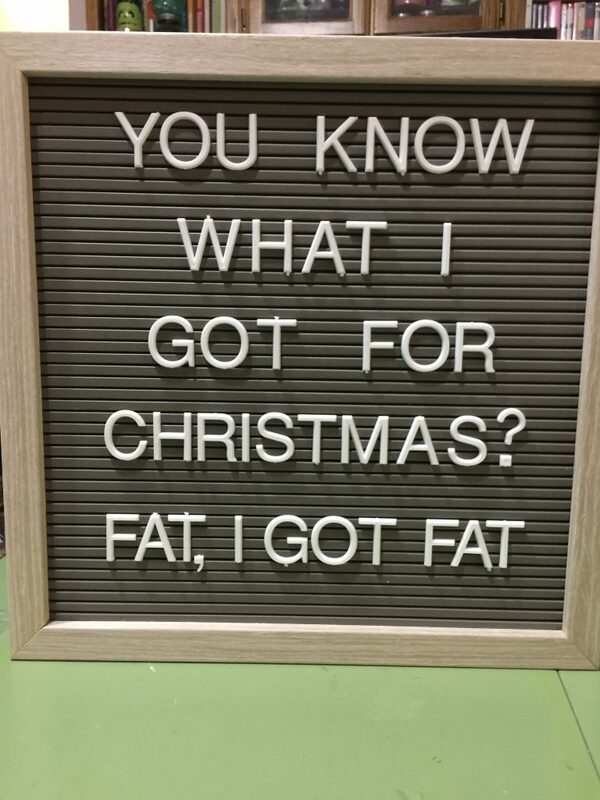 As far as what I got myself for Christmas, well, besides the instant pot, is my letterboard saying below. Christmas morning was a nice lazy morning. 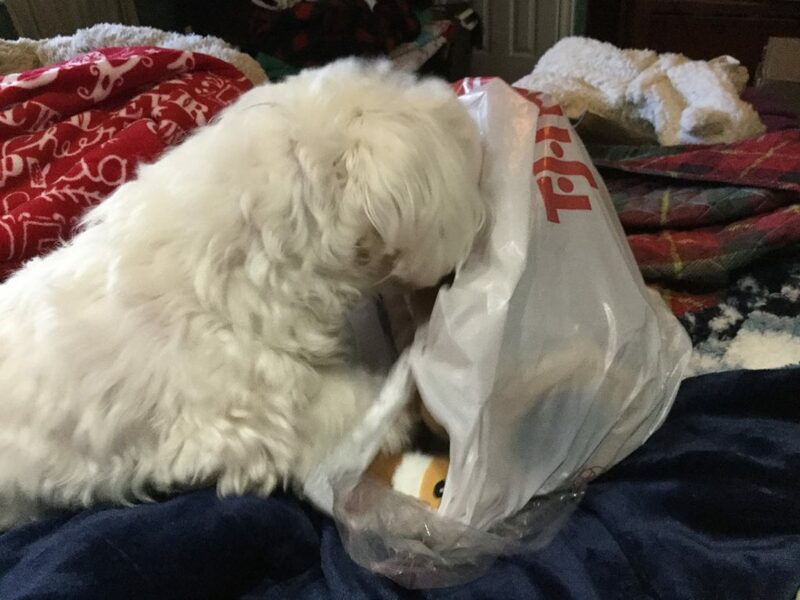 Unlike children, the dogs do not care it is Christmas Morning….until they see the toys. Miss Olive heard the squeak of a toy and went crazy digging into the bag. I have long since given up on wrapping the dogs gifts. A) they don’t appreciate it B) saves me money. Miss Olive received two toys. A squirrel log with three squeaky squirrels. And a hot cocoa mug with three squeaky marshmallows. As of today, I have no clue where the toys ended up. Probably under the bed. 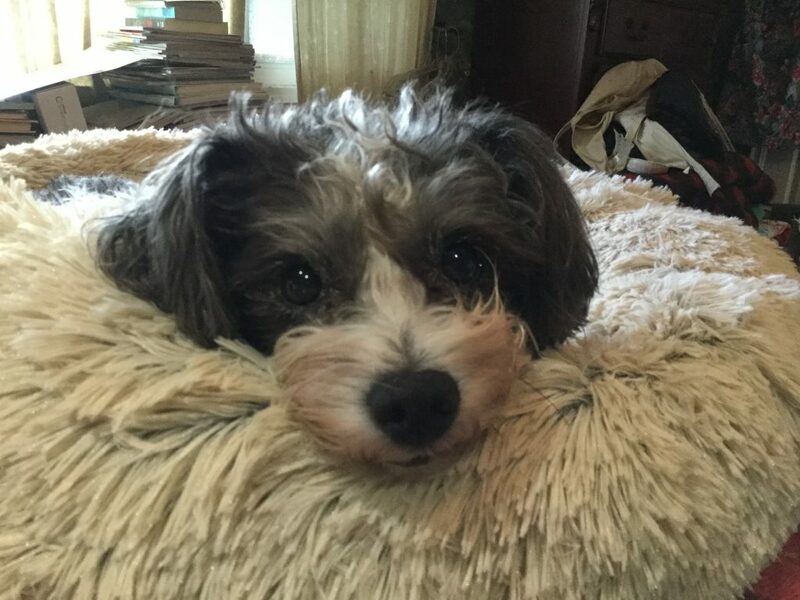 Miss Penny received a new fluffy bed and a new red blanket. I need to sneak the old ones away and toss in the traash. They are so old and dirty, even after many washings. Chilling in the new bed. Penny was not sure, but then she got into it and relaxed. Her little face says it all. I tend to get carried away. As I do every year. Not sure why I do that. 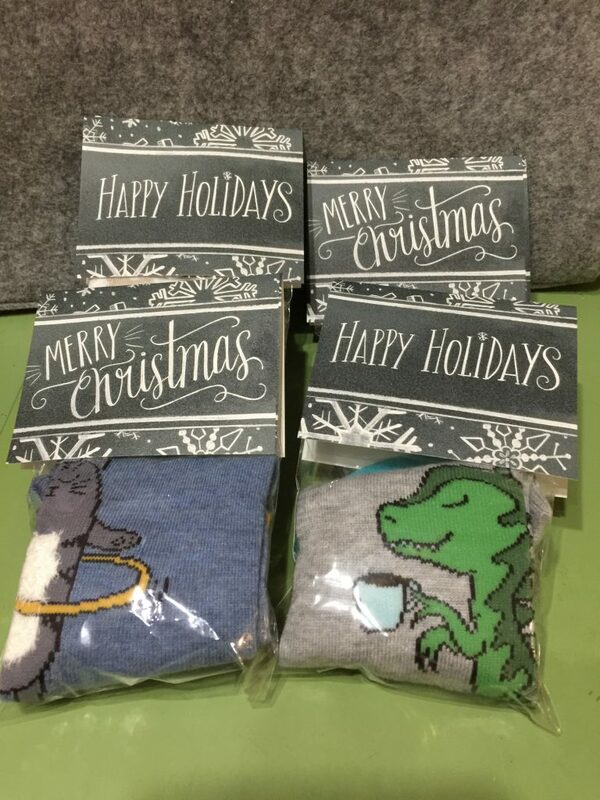 Besides the Jam I made for my co-workers, I also gave them cute socks. I had a hard time figuring out how to package the socks. 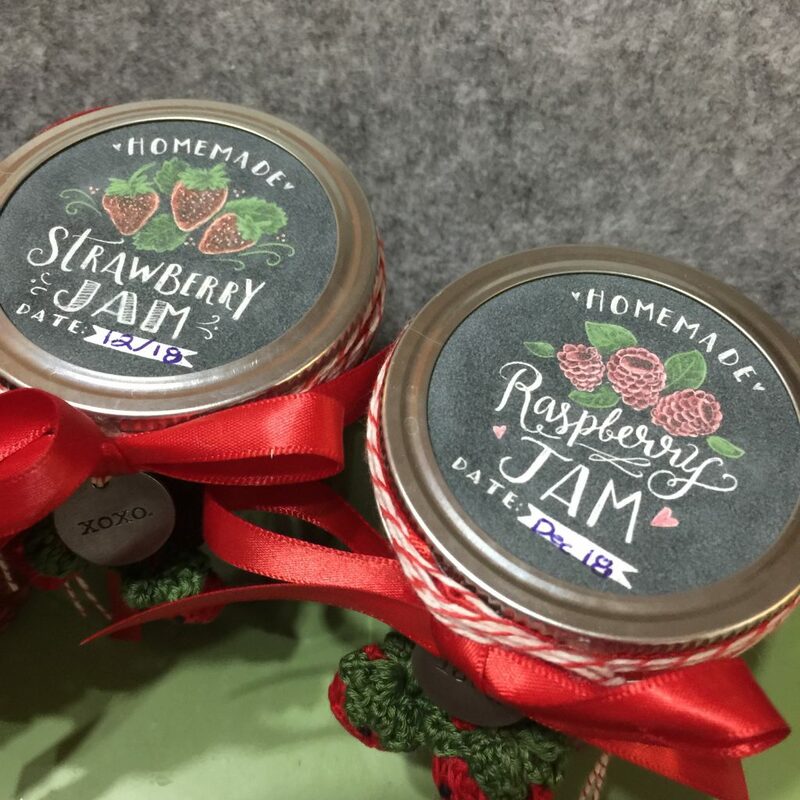 Then I decided to use the same type of labels that I did for the jam jars. I photo shopped these to make them smaller so they would fit over socks. 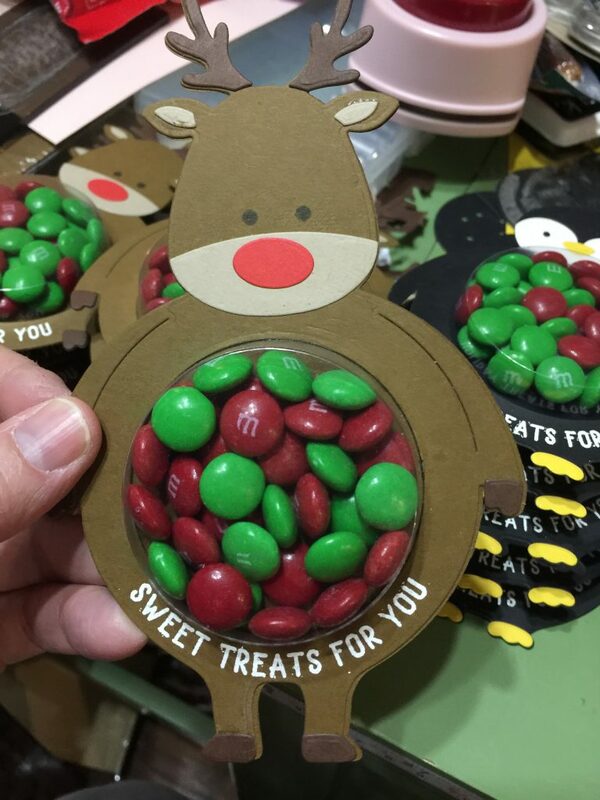 I also used some candy cellophane bags I had in the drawer to package the socks. I got these cute socks at Target. They have the cutest socks out there. I especially like the Xhilaration brand. Cute as can be. I just noticed they have Valentines socks. Oh dear. 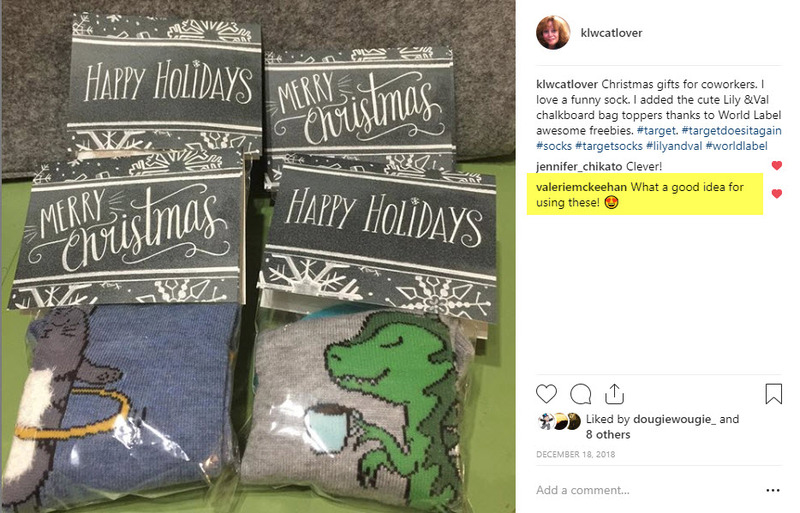 What was so cool is when I posted my socks on Instagram, Valerie McKeehan from Lily & Val, who designed the chalkboard labels made a comment about my post. How cool is that? 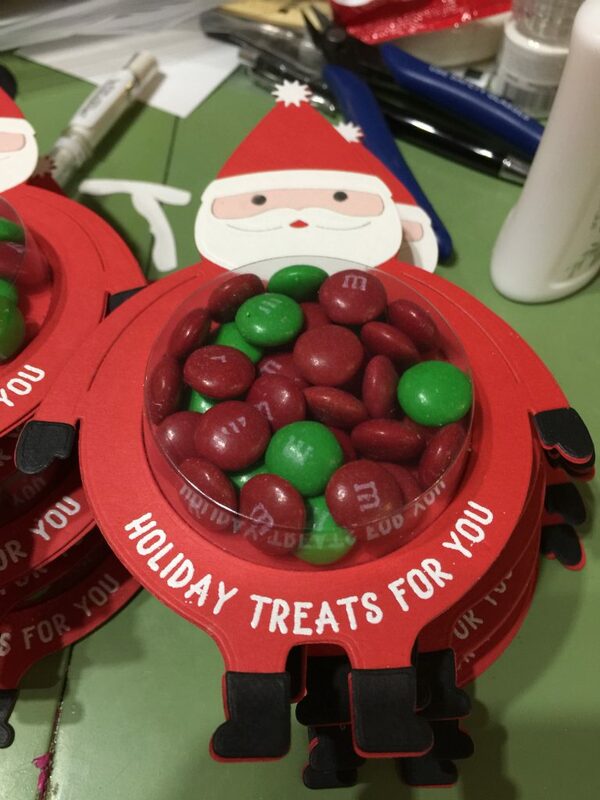 Of course I received a couple of gifts from co-workers and I felt awkward, so I decided to make some treat holders. 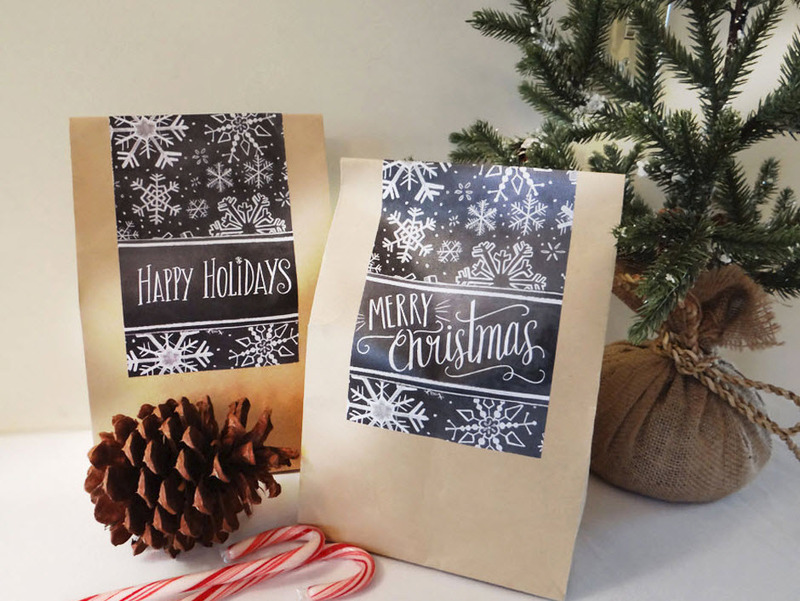 These super cute dies make a quick treat goodie, unless you make thirty of them like I did. 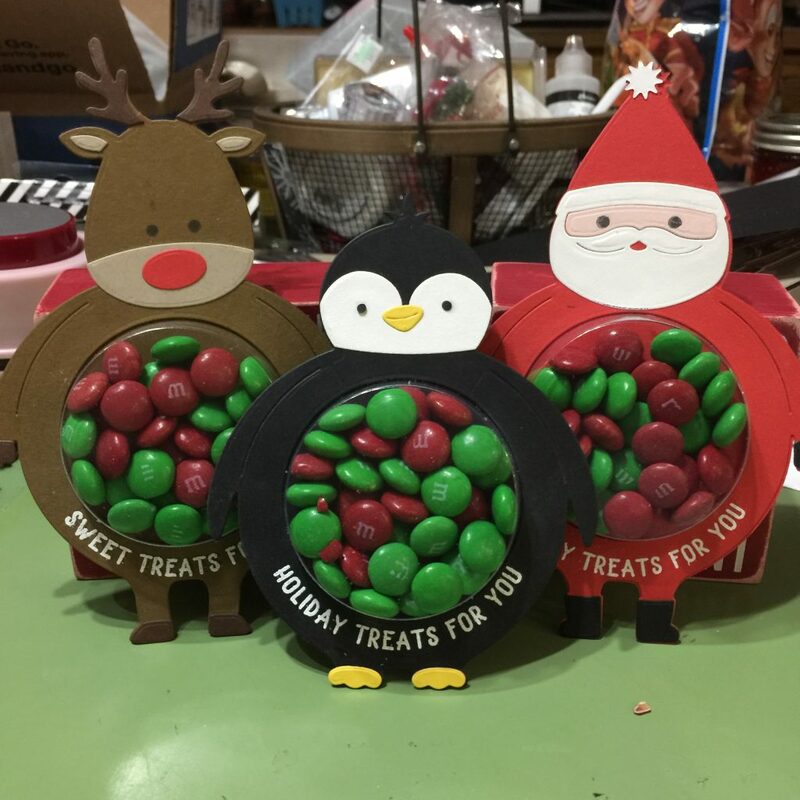 I did not want to forget anyone for the holidays. So all weekend I was gluing stuff again. Big Sigh! I am not sure which one I think is cuter! I have to admit I am glad that is all over with. I will try not to do that again. 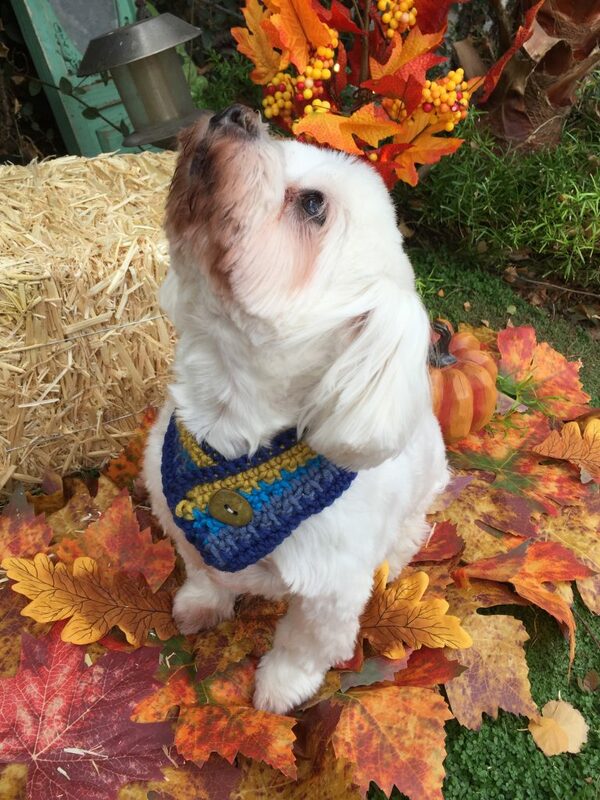 It seems to take forever for Autumn to show up in Southern California. 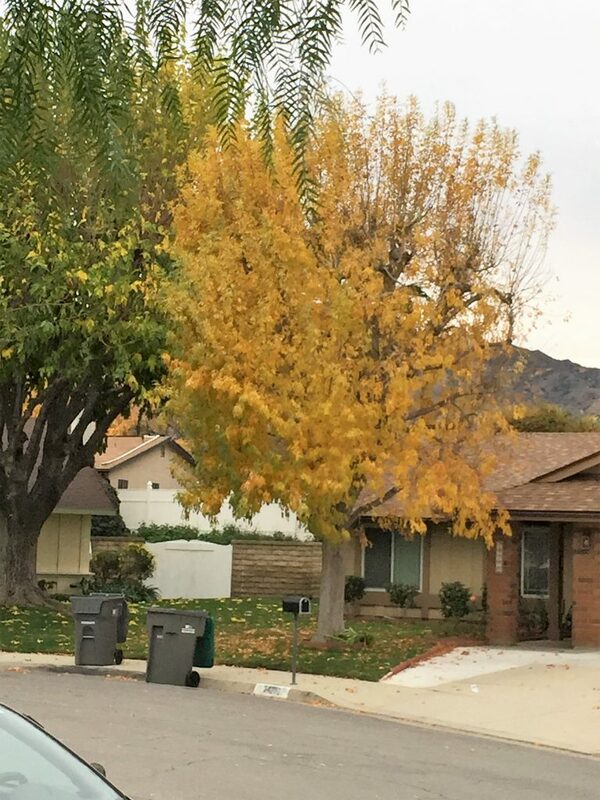 Here it is in December and I noticed the neighbors trees had finally turned golden. When I drive to work I drive down a street that has beautiful trees that turn golden and red with a touch of light green. And for a brief moment I have Autumn. I love the feeling. I tell myself I simply must move somewhere that actually has autumn. And an Autumn that happens in November and not December. Autumn here only lasts for a few weeks before the trees are bare, and winter is here. On this particular day all the trees had turned golden. I marveled on the drive home how pretty all the trees where. When I parked my car, I looked up and noticed the glory of the golden leaves I just had to capture it, if only to remember Autumn for more than a week. 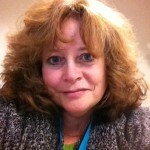 It was cold…. it rained that night….. I wanted HOT apple cider…. I did not have any…. A picture of a Starbucks cup is boring…. 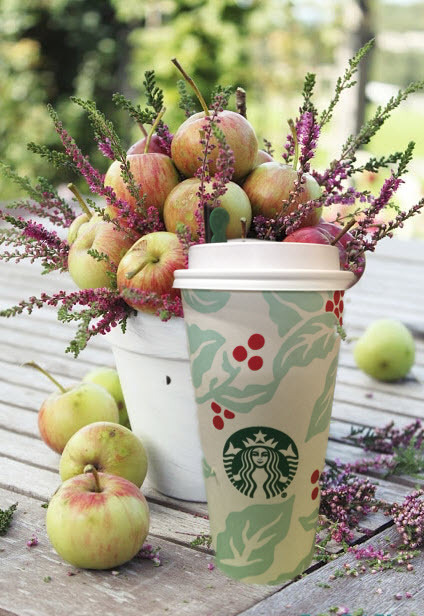 So I added the picture of the cup on a nice table with apple floral display. 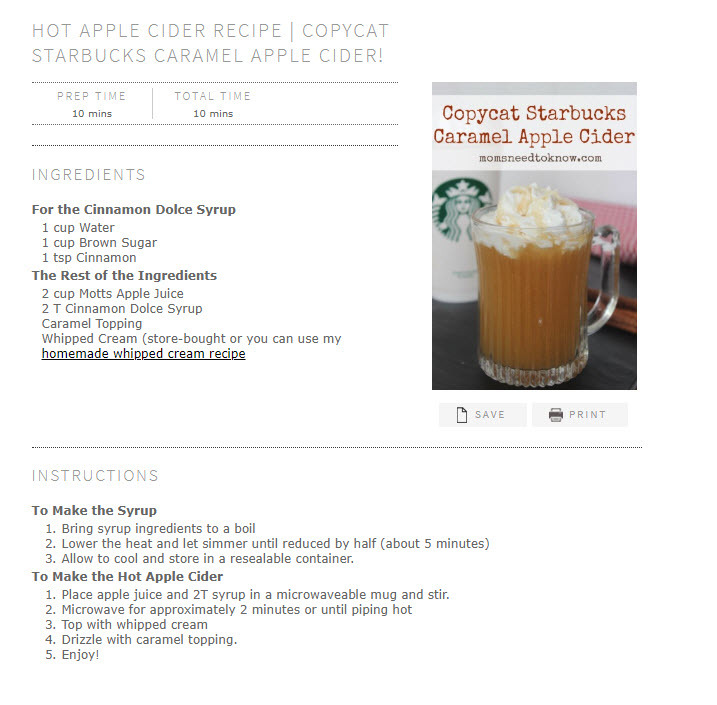 So since this post is rather boring, I thought I would add a recipe for Starbucks Copycat Apple Cider Recipe. I snagged this from www.momsneedtoknow.com Click on the recipe to go to her website. I think I forgot to add this onto the blog. I posted to Instagram but forgot to post here. 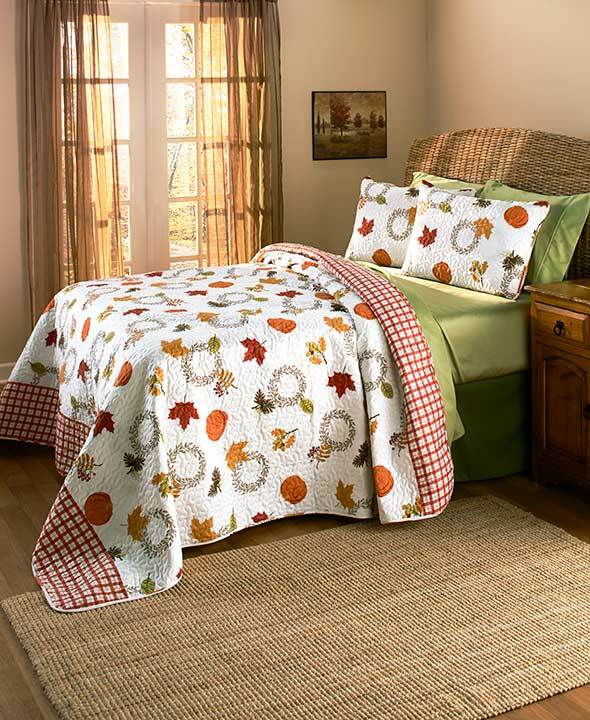 I found this cute little cover from a catalog called Lakeside Collection. 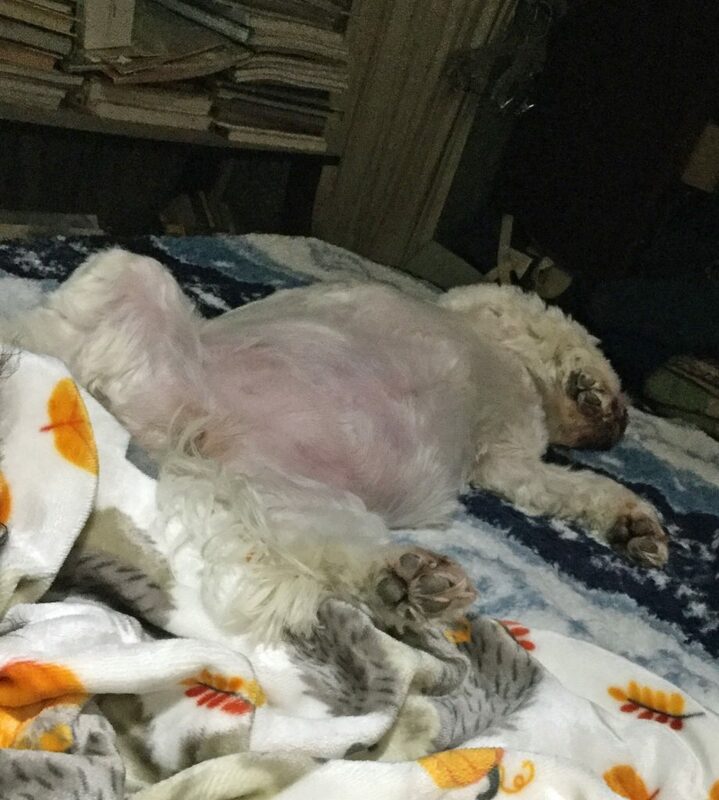 Here is my bed. 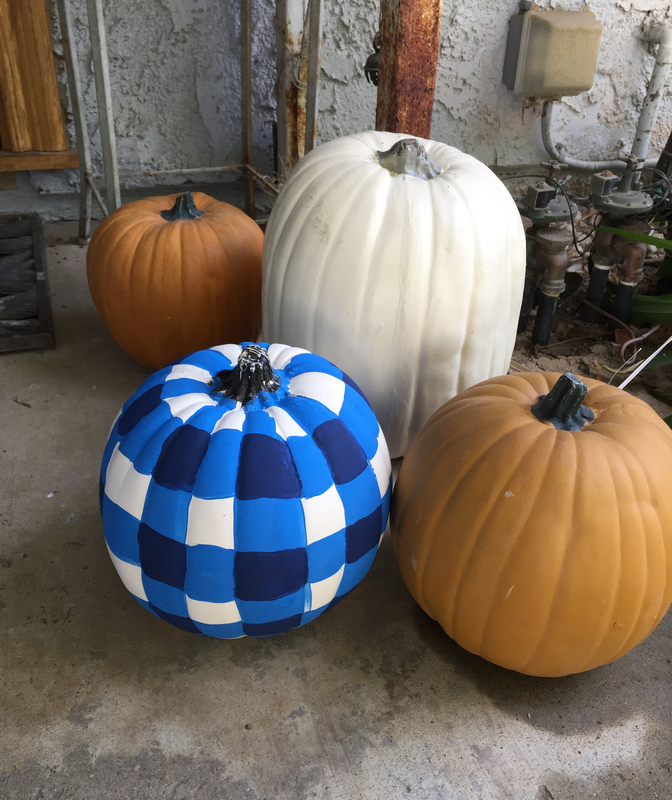 It threw a pumpkin decorative pillow on to make it complete. 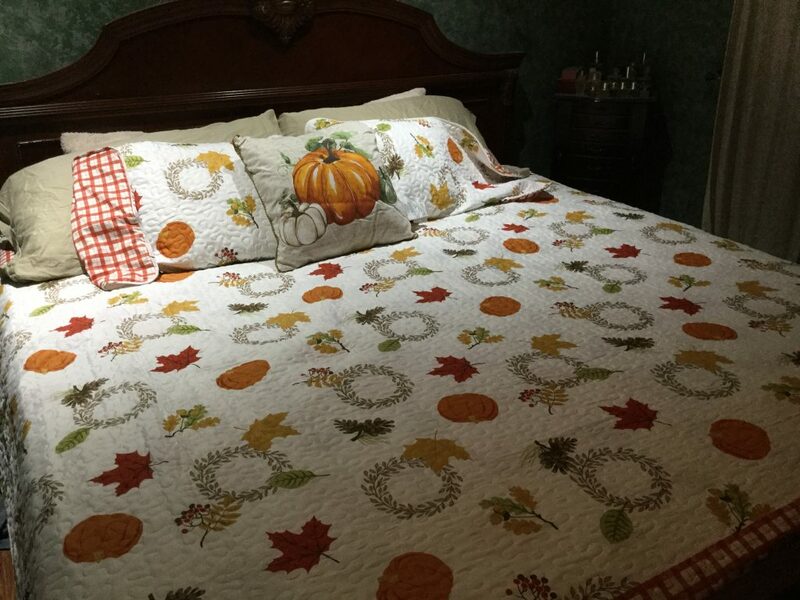 It is a thin cover but surprising that the print is on both sides and came with the two pillow shams. A great deal for $35 bucks for a King-Sized item. The pattern is so cute. I think it was worth it. Click on the picture to take your self to the website. It has been cold here. Which is a bit surprising since we are in the middle of wildfires. In fact it rained last night. I was so excited to hear the rain, a true surprise. The cold inspired me to jump into bed, pull up the quilts, blankets, pillow and dogs. 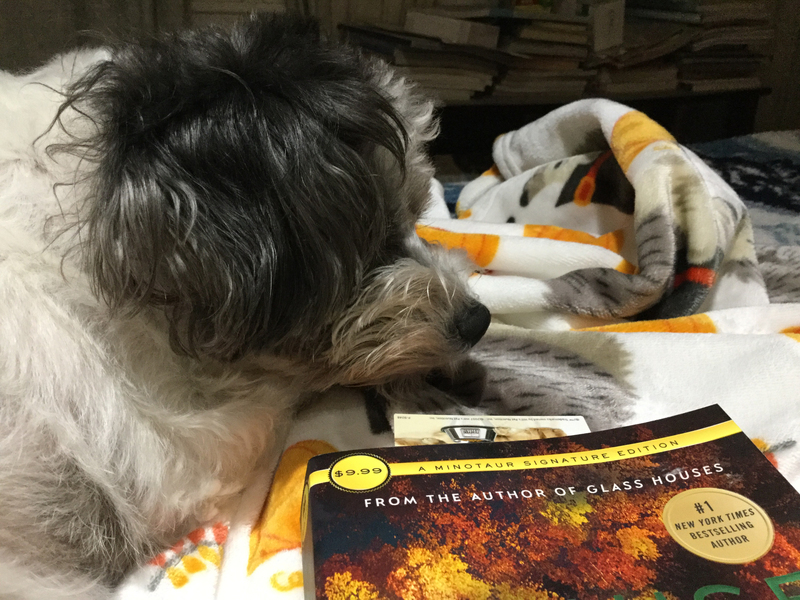 I grabbed a book I just started that felt like autumn. Penny loves to get on the bed with me. 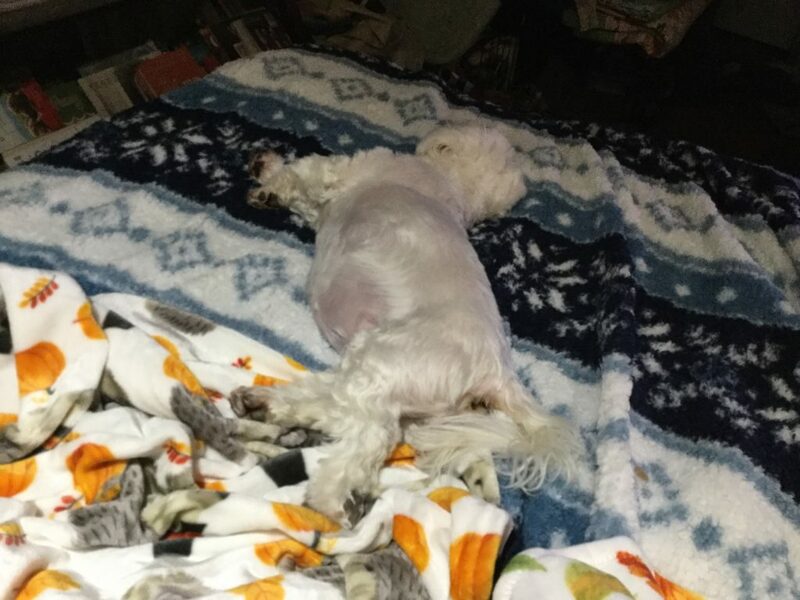 She loves sleeping next to me as she may get a belly rub. 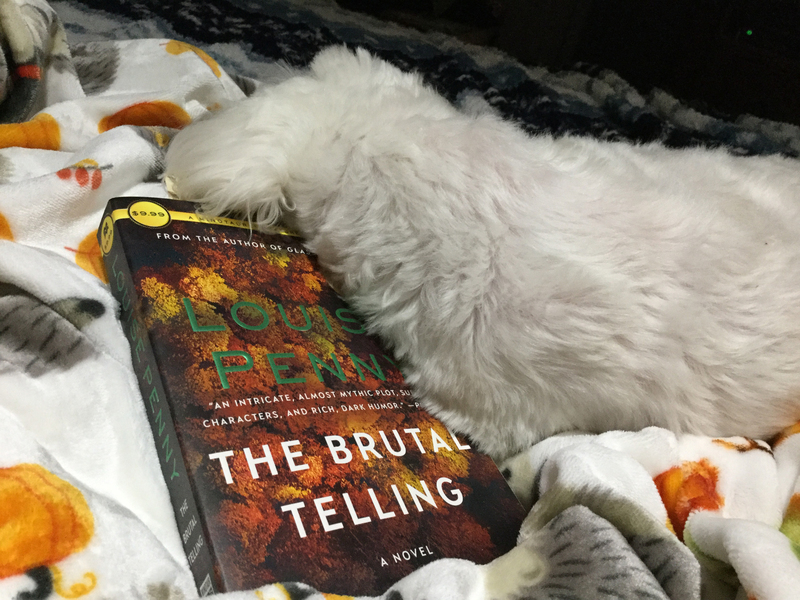 Olive decided to sleep on my book. Makes it a tad bit hard to read. 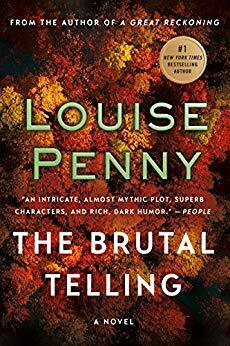 I picked up this book because it had an autumn cover. As Olivier grows more frantic, a trail of clues and treasures— from first editions of Charlotte’s Web and Jane Eyre to a spider web with the word “WOE” woven in it—lead the Chief Inspector deep into the woods and across the continent in search of the truth, and finally back to Three Pines as the little village braces for the truth and the final, brutal telling. 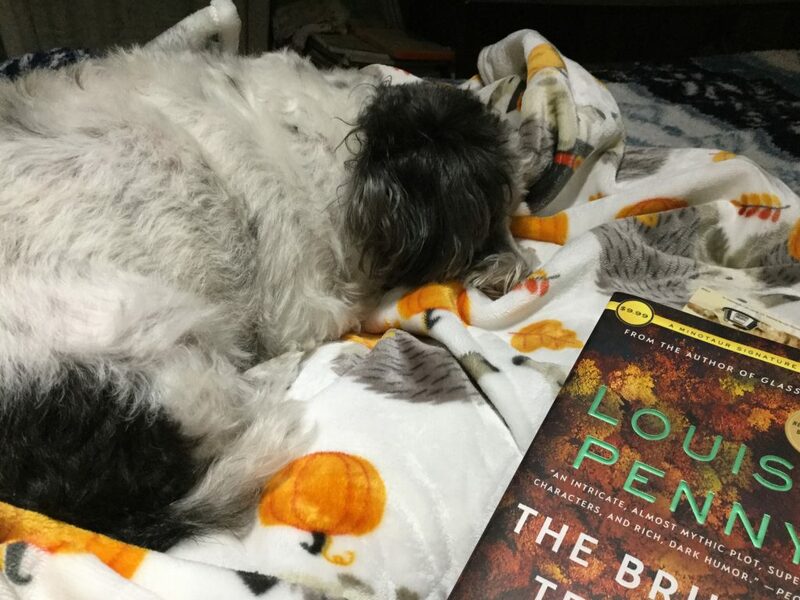 Getting this book had no correlation of the name Penny on the book and my dog. Just a coincidence. Of course Olive got in the mood and started to snore and roll onto her back. Glad she can sleep anywhere. I think it is time to curl up under the covers with the fur kids. 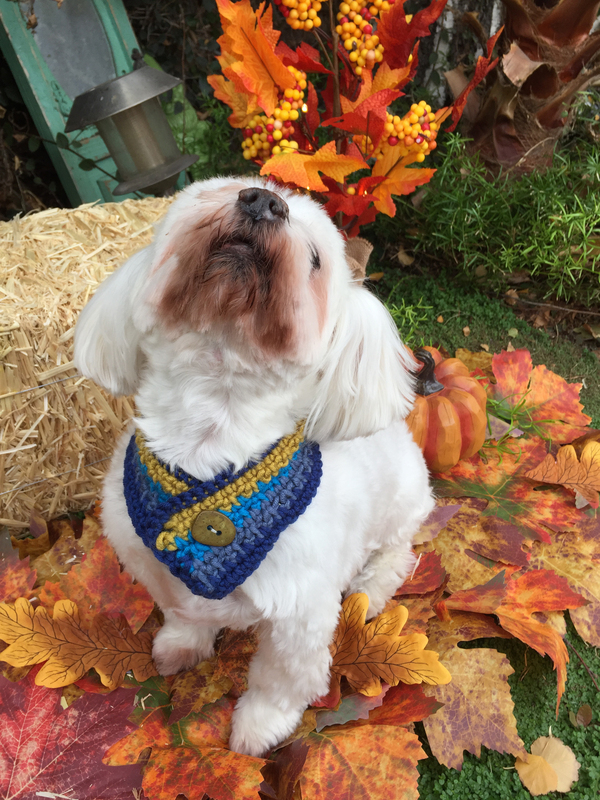 I watched this video on making little dog scarfs. I was excited to see something for a small dog. Most patterns out there were for large dogs, and this pattern was great for Penny and Olive, but she also gave instructions on how to make it larger just on case. For the written instructions, she also put it out on her blog. 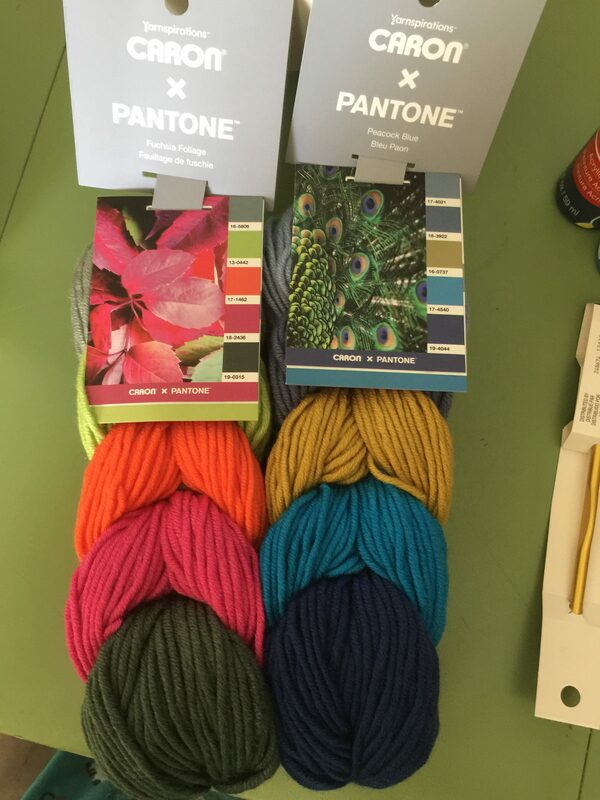 I found some cute yarn at Michael’s Craft Store in Pantene color palettes which intrigued me. 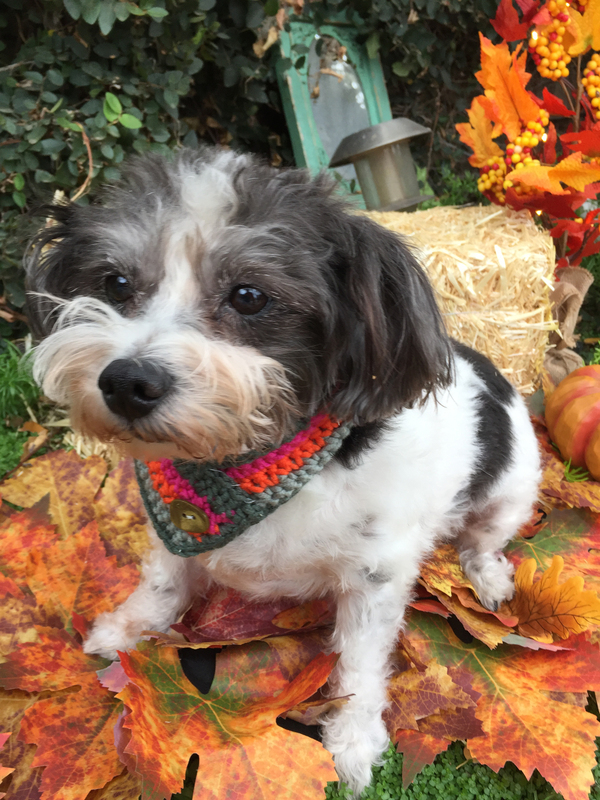 It was enough yarn to make several but I figured the pooched only needed one. It was quick and easy to make. I got some props to make it look more autumn. Since I live in Southern California there is rarely any Autumn scenes naturally. Work with what you have. Penny was up first and she has no patience for Mom’s silliness. Fortunately Penny does follow commands and actually sat there when I told her to. Nothing Baby….. you are a good girl. Thanks Mom! 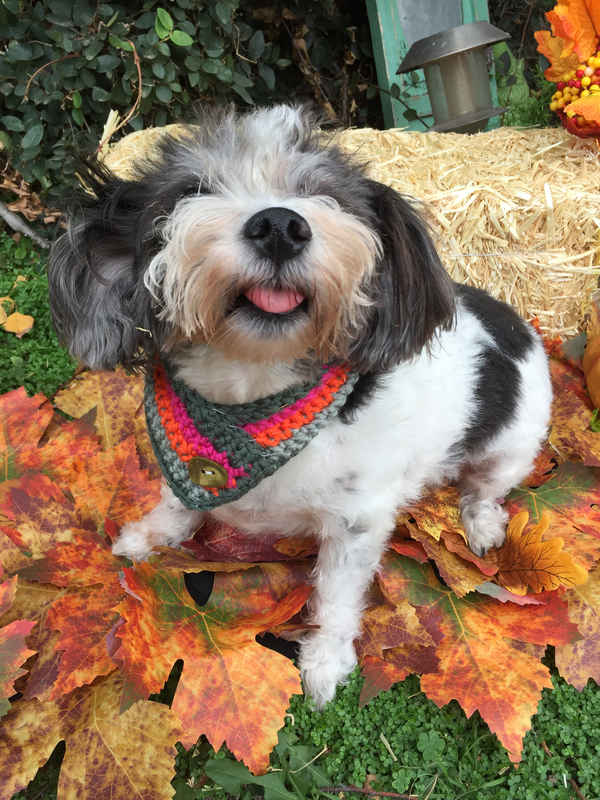 Here is a little tongue action for your camera. 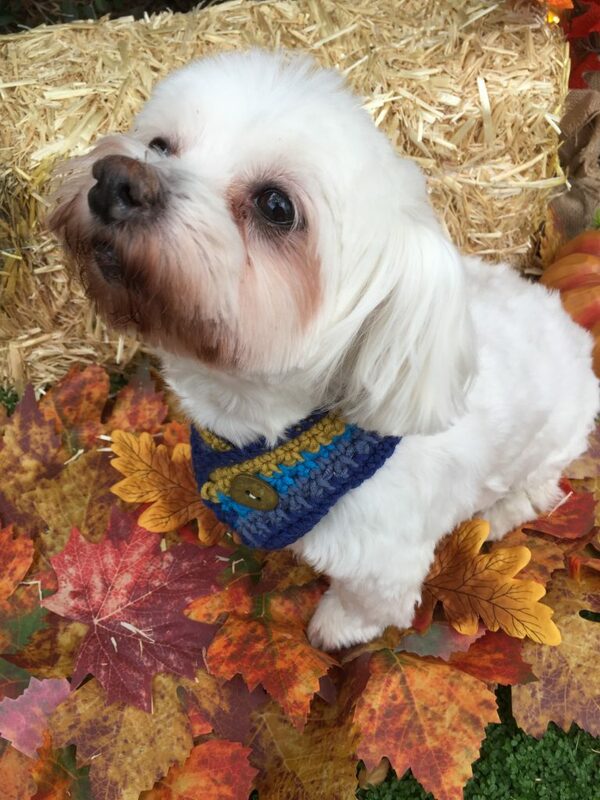 I wish I could be over there, by the grass and look for squirrels. Not so fast little one. 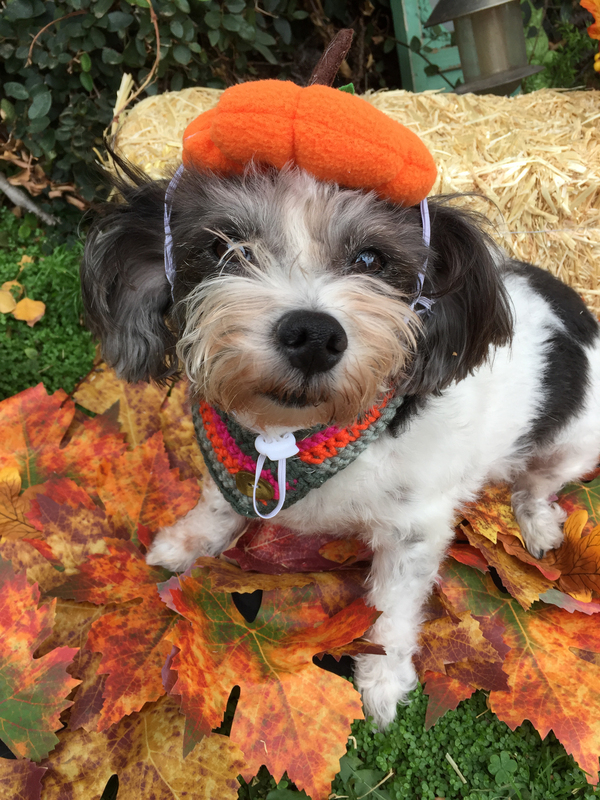 Must wear the pumpkin hat now. Ummmm Mom, I dont think this is cool. My friends will laugh at me. 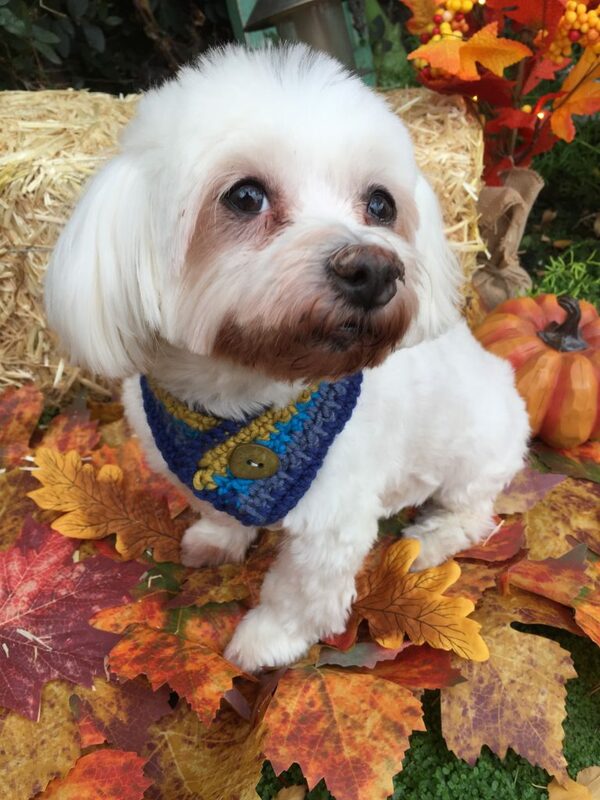 Penny, you don’t have friends….you bark at every dog you meet. OK baby, I will let you go…… So where is Olive. When ever I tell Olive to “stay” she thinks she is in trouble. She has to look at the sky and avoid eye contact. La-dee-da….. I don’t see you…..
You are almost there Olive…. you are not in trouble. 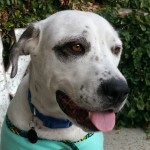 Show us your pretty face and new fancy collar. 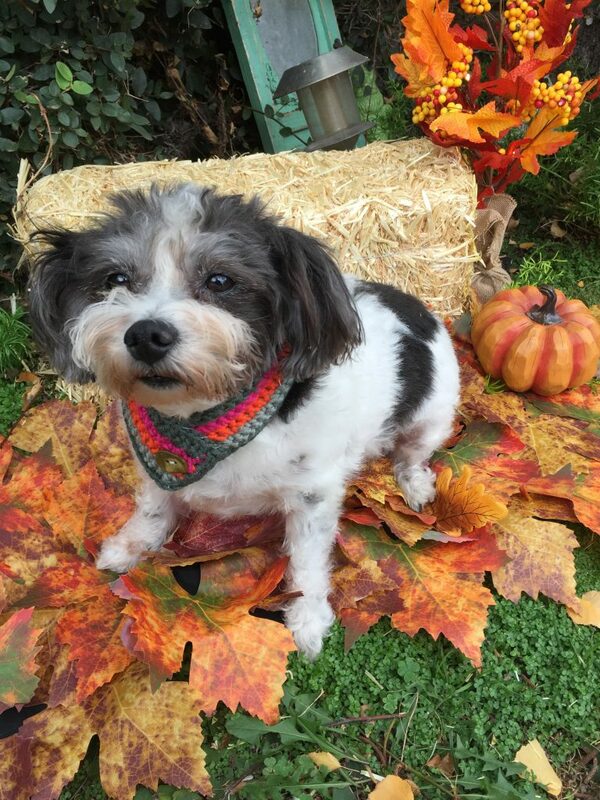 Thank you Miss Olive…. you are free to go. So these pics are a tad bit late on the Autumn Bucket list. I kept forgetting to get those pictures taken. And being I am trying to pack up the remains of Halloween, right on the heels of packing up the Thanksgiving stuff. Geez and I slow or what. Does anyone else have this issue??? I quickly took some pics and called it a day. This year I was more into Autumn instead of Halloween. So I was very minimal on the decorating. 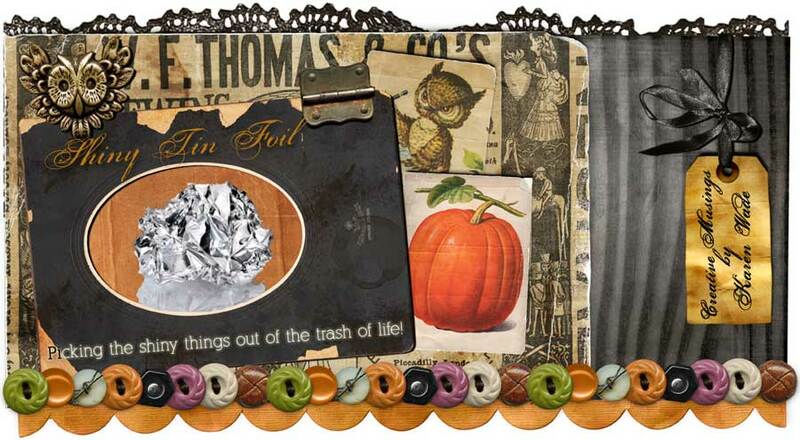 I did put out my classic stacked pumpkin ceramic. I have to admit Michaels knocked it out of the park with this one. 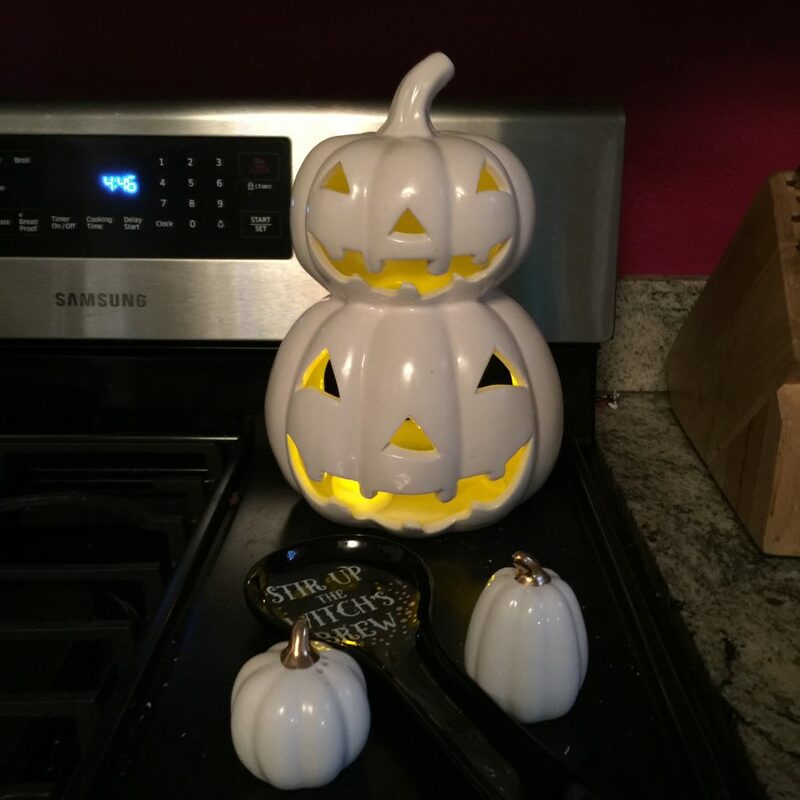 It was inexpensive and so darn cute. This one goes on the back of my griddle on the stove. Looks all nice lit up at night. 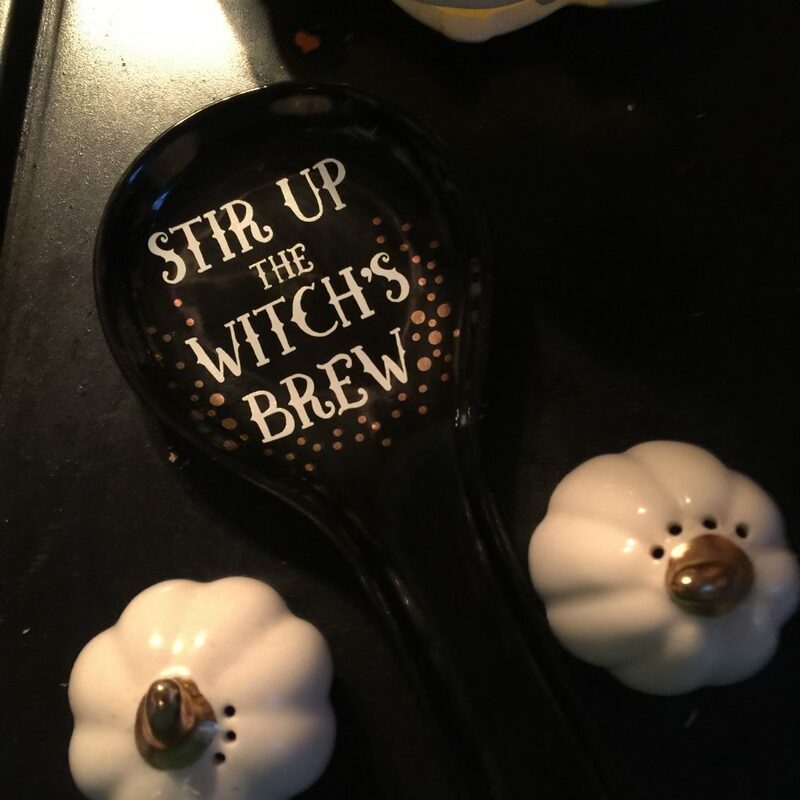 I do have a new addition, it is the Witches Brew spoon rest. 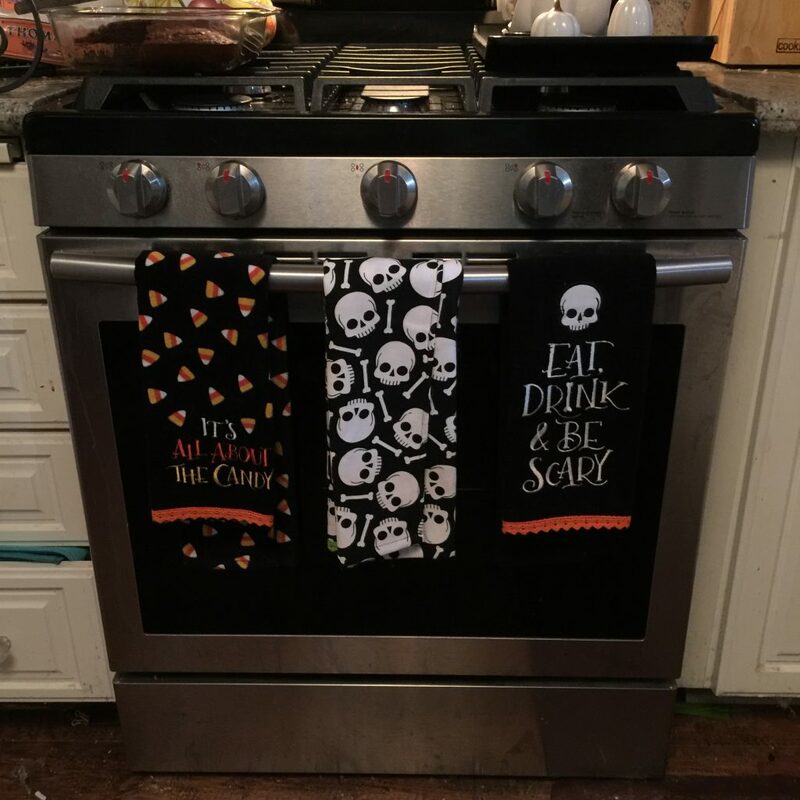 I got it at Home Goods where wonderful things wait for me to buy them. I put my pumpkin salt and pepper shaker out but I dropped something on the little leaf that it sits on. Need to pull out the crazy glue and fix it. At least it was a clean break. 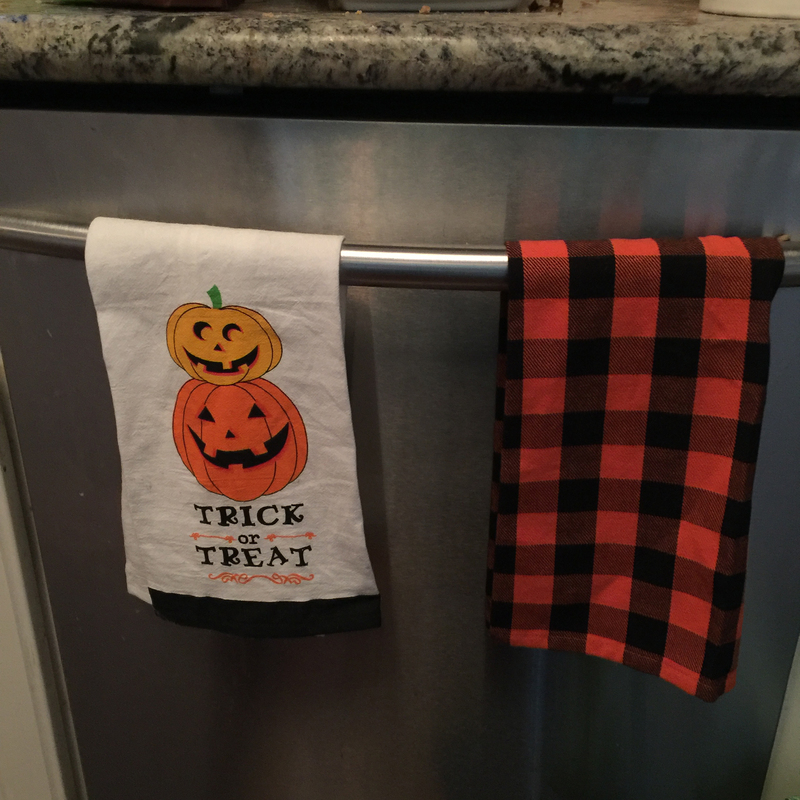 I always put own towels on the stove door because it really makes the decoration. Not to mention also on the door of the dishwasher. 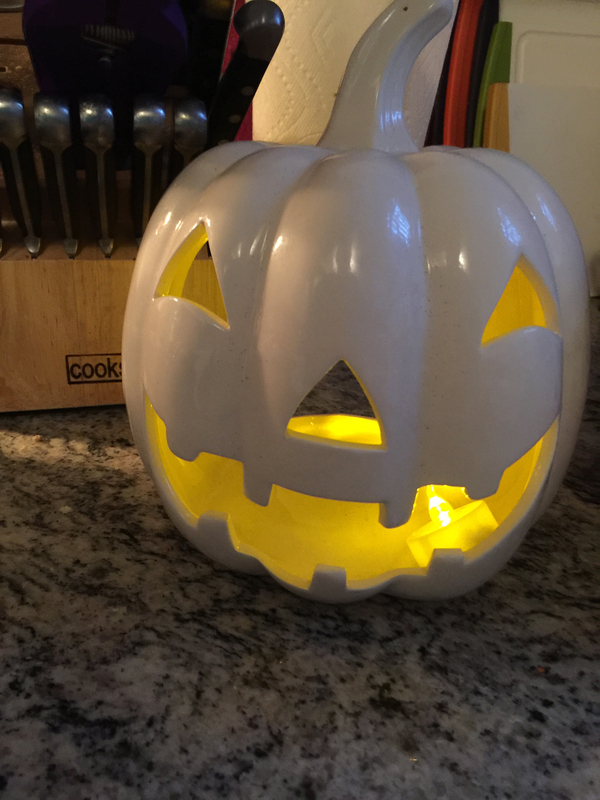 And finally the single pumpkin on the counter top. Not a lot this year, but it was enough to set the mood. 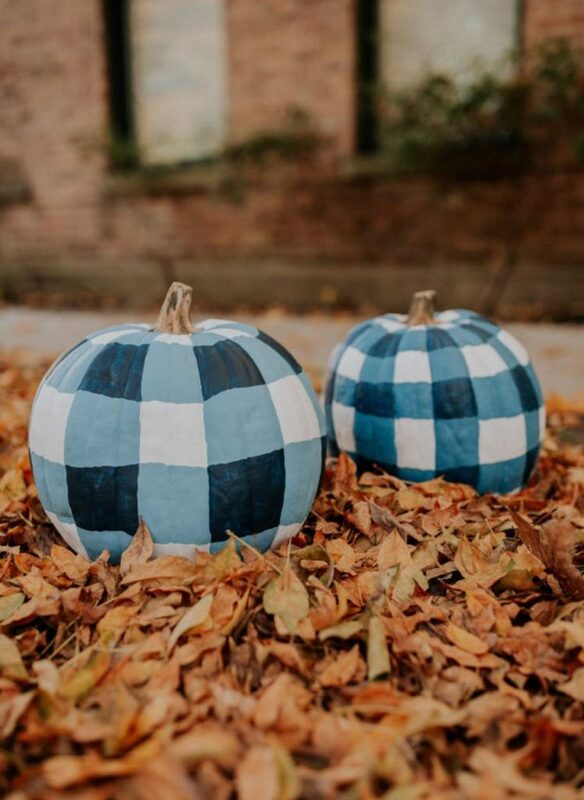 Sometime ago I saw this gingham pumpkin on Pinterest. I thought, geez I can make this. Normally I only like Orange or White pumpkins, but this just called to me. 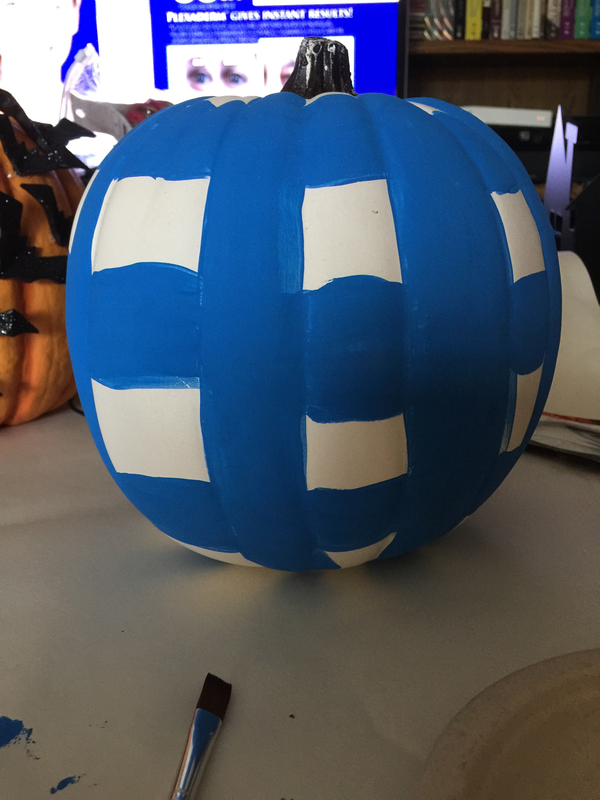 Originally I wanted to do the pumpkin in gray, but could not find two colors I liked, so I went with blue and navy. 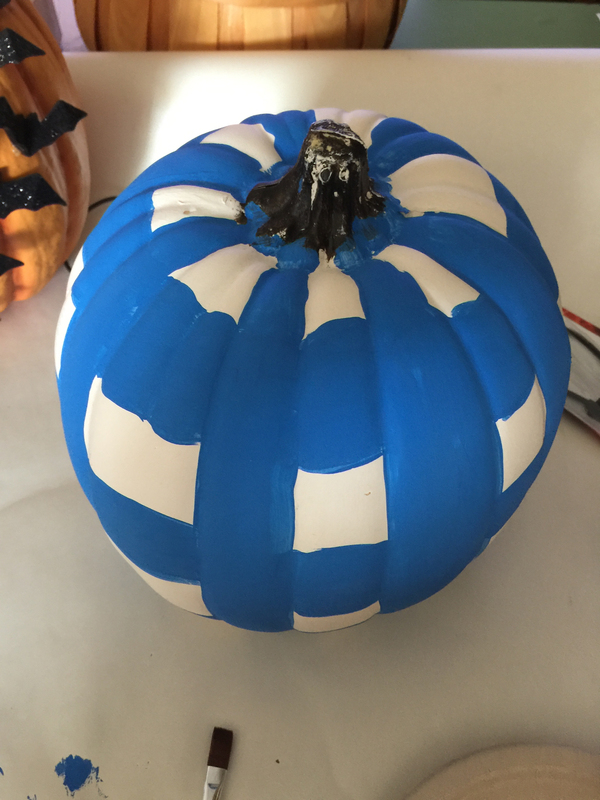 I did not realize how hard it is to paint a straight line on a curvy pumpkin. Ugh this is not going well. 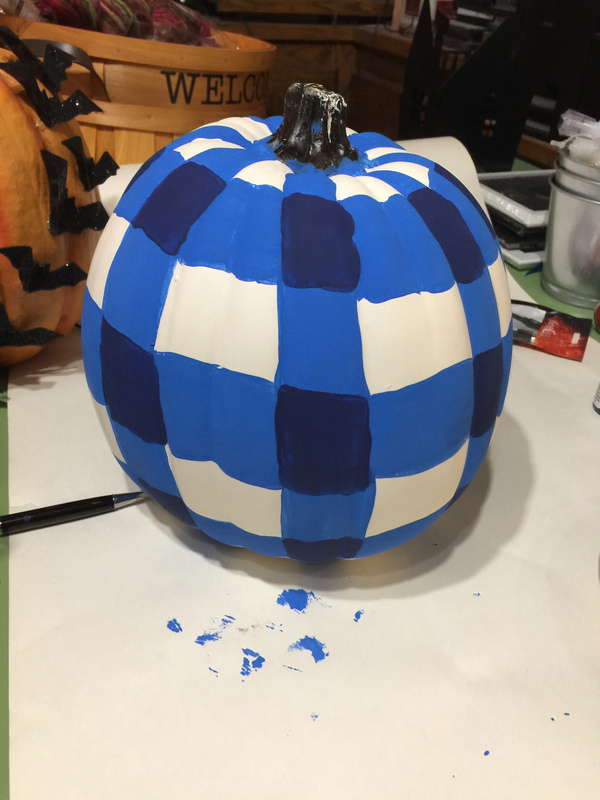 OK it is looking a little bit more like a gingham pumpkin. A little messy here and there. There is she is, on the front porch with the classics. 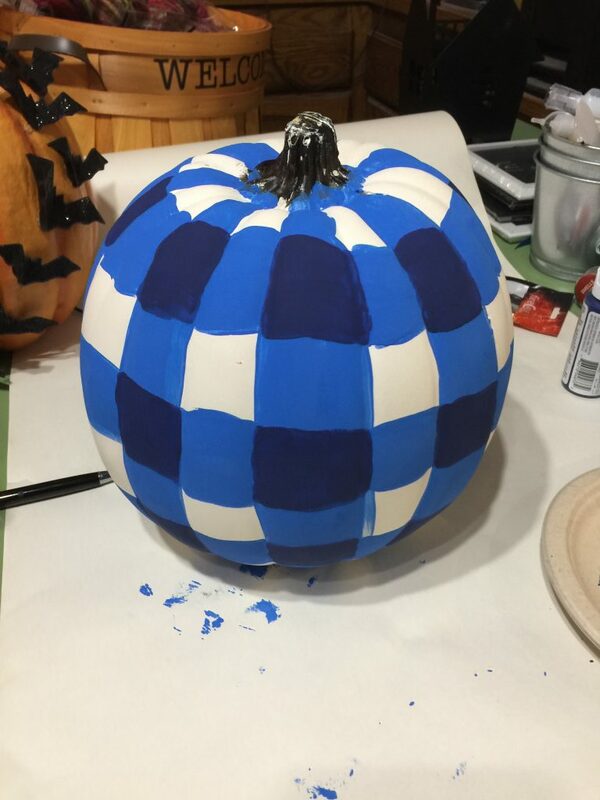 Thank you gingham pumpkin for not being too much a problem. 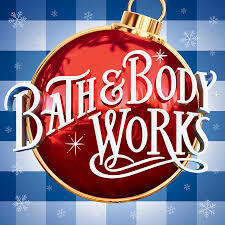 However my pumpkin tends to look like the Bath & Body works logo. Hmmmm wonder why!